FX Market Report believe today’s Eurogroup decision for a €130bn Greek bailout won’t be a full agreement, but a partial deal with “difficult and contentious issues unresolved until a later date”. “Here at FXMR we remain convinced that Greece is irreparably broke and has no sustainable debt dynamic other that a default and a new beginning”, writes Gavin Grier-Rees, stating that Germany, Netherlands and Finland already voice the same opinion. “That’s why we predict ever harsher conditions will be imposed on the Greeks until they eventually are forced from the single currency. What we are seeing here is both sides trying to avoid being given the blame for ending the dream of a single currency”, he adds. FXMR analysts believe the strong week start, high at 1.3240, was a relief move as Greece didn’t default this weekend. 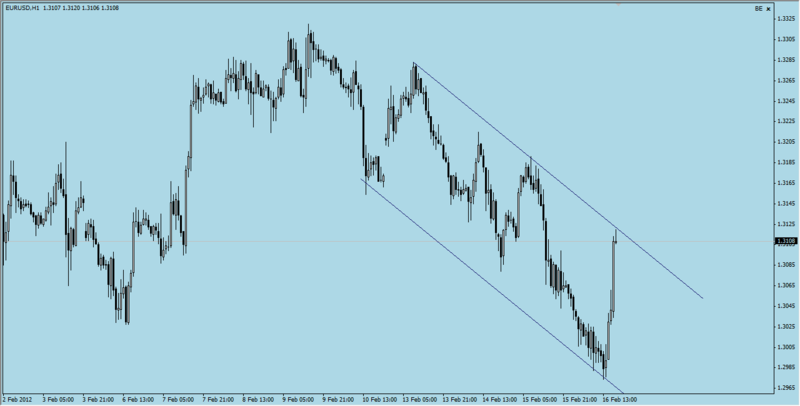 “Risk‐reward must be to the downside”, with supports at 1.3110-15 and 1.3145-50. As news disappoints, last week’s lows at 1.2975 is next target. Despite dipping to as long 1.2974, EUR/USD rebounded strongly and the breach of 1.3190 minor resistance dampened the immediate bearish view. Initial bias is neutral this week for some sideway trading first. 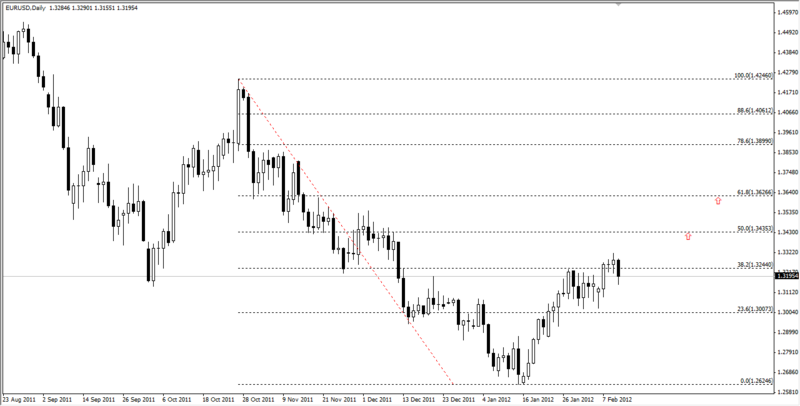 On the upside, above 1.3321 will resume the rebound from 1.2625 and target 61.8% retracement of 1.4246 to 1.2625 at 1.3627. On the downside, below 1.2974 will revive the case that rebound from 1.2625 is finished and flip bias back to the downside for this support level. In the bigger picture, price actions from 1.6039 are unfolding as a consolidation pattern in the long term and is in progress. Fall from 1.4939 is a falling leg inside the pattern. It’s hard to anticipate the length of a leg of any complex corrective pattern. Also, price actions would likely remain choppy and indecisive with misleading momentum indicator readings. But after all, overall picture still favors deeper fall to 1.1875 support before the consolidation pattern completes. Though, sustained trading above 55 weeks EMA (now at 1.3588) will pave the way for a test on 1.4939 resistance level. In the long term picture, EUR/USD turned into a long term consolidation pattern since reaching 1.6039 in 2008. Such consolidation is still in progress and we’d expect range trading to continue for some time between 1.1639 and 1.6039. The rally in the single currency sparked in mid January seems to be in a wait-and-see mode since early February. The Greek front – parliamentary vote on Sunday on the extra austerity measures, PSI talks, bailout package, domestic unrests – has been, and it is, the main driver in the evolution of the FX markets as of late, and this week appears to be the “make-or-break” one regarding the relation between the bloc currency and Greece. The euro-group finance ministers meeting on February 15 has been pointed to be the deadline as the “troika” could decide whether to release the next tranche of the bailout package, vital to honour the debt rollover expiring on March 20. M.Mohi-uddin, Managing Director of Foreign Exchange Strategy at UBS, remarks that a positive outcome from Greece will be supportive of the shared currency, at least until the second LTRO, due on February 29. So, what lies beyond the end of February? The expert remains conservative on the euro, as the ECB has hinted the likelihood of further rate cuts if the economic conditions in the bloc worsen, spilling their effects over the prices. Reinforcing the above, members of the euro zone already embarked in more austerity measures could see their economic growth undermined in the upcoming quarters and also political risks are looming with Greece and France holding elections in the next months. All in all, a not-so-cheerful panorama is lying ahead for the euro. “As a result we continue to see the euro ending the year at 1.15 against the dollar”, the analyst stressed. Despite edging higher to 1.3321 last week, EUR/USD lost momentum from there and retreated sharply. A short term top is likely in place with bearish divergence condition in 4 hours MACD. Initial bias is neutral this week with focus on 1.3028 support. Break there will indicate completion of the rebound from 1.2625 and bring retest of this support. Also, in that case, whole decline from 1.4939 is likely resuming for another low below 1.2625. 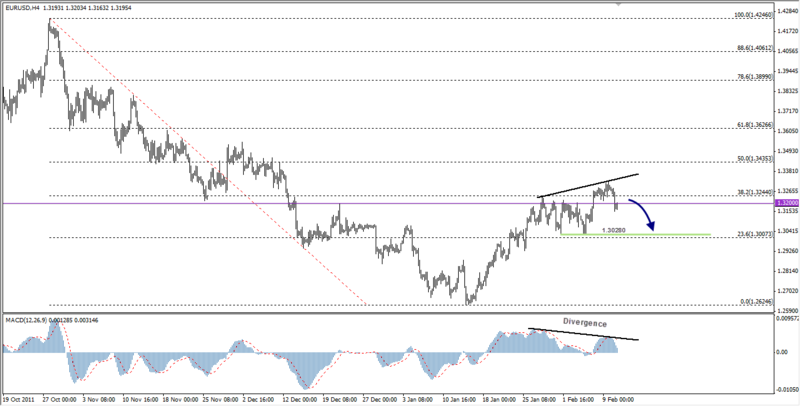 On the upside, above 1.3321 will extend the rebound from 1.2625 towards 61.8% retracement of 1.4246 to 1.2625 at 1.3627. With all eyes on Europe and its press conferences, ECB Mario Draghi’s first and another one after the Eurogroup meets, clarifications about the Greek debt writedowns are due. FX Market Report analysts remain skeptical about the whole thing: “For us the peripheral problems are ‘structural’ and cannot be solved by throwing good money after bad. The ongoing policies of austerity are just compounding the down turns and making debt servicing impossible, let alone debt repayment”, says Gavin Grier-Rees. Grier-Rees also points to a very high price in the EUR/USD (700 points above 2012 low) when taking in account the risks of a downfall: “. In other words buying euros at current levels risks running into the recession that is being caused by austerity policies. On the charts the trends continue higher but we are minded to wait until after news releases to play the short side”. FX Market Report analysts are very skeptical about Greece’s permanence in the Eurozone, accepting the “dictated” terms and spend many years under harsh austerity. “At what point are the bailout conditions so unpalatable that it becomes worthwhile to not take the money but default instead? We suspect that this is the outcome really being sought by the core Norhern block”, writes Gavin Grier-Rees. A signed agreement should take the EUR/USD to further gains, but the outlook is very dark as Greece might default anyway: “This is through the 1.3240‐45 resistance level and targets 1.3435 (50% of the Q4 2011 down move). There will be some long‐term investors who will be waiting to see the ink on a Greek agreement before stocking up on euros. For us they may well be paying the top…”, adds Grier-Rees. First supports would be at 1.3215, 1.3150 and 1.3050.